In lieu of flowers, the family suggests memorial contributions be made to the following charity. Westcot Bell Stone, III, was born on August 23, 1920, in Los Angeles, California. He passed away on August 8, 2017. He is survived by his daughter, Elizabeth Stone Moore, his son, Westcot Bell Stone IV, and his grandchildren Ashley, Hunter and Hannah. Wes was predeceased by his former wife, Bette and his second daughter Kimberley. Wes passed away peacefully in his home where he lived for 61 years. Wes was born in the front seat of his father's brand new 1920 Buick, which was the beginning of his adventurous life. In 1929 he and his family took a seaplane to Avalon, California to see the opening of the casino. It was then when Wes fell in love with the plane and the ocean. Wes built Dory boats in high school and used them to travel to Catalina with his friends and brother every summer. During their summers they would dive for coins to support their stay on the island. After graduating high school Wes entered University of Southern California and took flying lessons. Two years later Wes entered the Army Air Corps during WWII. He became the pilot in command of the B-24 Liberator named 'The Mad Monk" which was the name of one of his boats. He flew 32 missions and brought he and his entire crew home safely. His brother was not as fortunate and lost his life while flying a P-40 in WWII. Wes became a pilot for Western Airlines in 1946 where he would work for 34 years. He always said he never worked a day in his life because he loved his job so much. Between trips his passion was sailing. He had many boats over the years and would include his friends on his trips. During the last two years while working at Western Airlines Wes was based in Honolulu, HI. So he and his family sailed his Cal46 from Redondo Beach, CA to Kaneohe, Hi. He used his boat as a place to stay and rest while he was between flights. Wes loved to travel and included his family on many interesting vacations, so in addition to sailing with his family to Hawaii they also travelled to Mexico, the British West Indies and Europe to name a few. 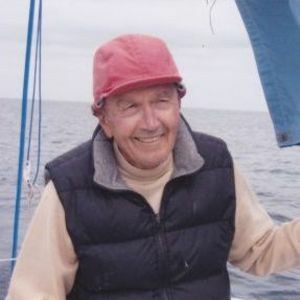 During his life he was a member of King Harbor Yacht Club (KHYC), Cabrillo Beach Yacht Club (CBYC), Kaneohe Yacht Club (KYC) and he was the Commodore of the Buccaneer Yacht Club (BUCYC). He enjoyed many years at all of the clubs. Later in life he began an exhaustive search for his brother Earl who crashed in the Philippines during WWII. Earl's crash site was located and searched for DNA, however the search was unsuccessful. Wes was hoping to bring closure for his family and for himself before he died. It was the only piece of unfinished business for him but his family has promised to carry on until Earl's crash site is verified. Wes lived his life to the fullest. He had such a positive attitude, everything was "doable" and he enjoyed every minute of his 96 years. Arrangements are under the direction of Forest Lawn, Glendale, California. God Bless you, Sir, for your service to our country and the 466th Bomb Group of the 8th US Army Air Corps! I am so sorry to hear of Mr. Stone's passing. We was a member of the city's PVE-CARES Senior program. Our hearts and prayers go out to family and friends for this loss. Dearest Elizabeth, I met you and your dad at the Western retiree luncheons at the Proud Bird. I was there with my dad (Cpt) Jimmy Dunn. The guys had so much fun together and loved their careers. It was so special for you and I to enjoy time with our dads as well as for my dad and I to get to spend time with you and your dad. Please accept our sincere support for your family . We were informed of Captain Wes's passing. Thinking of you. John, Gary, Kay and myself (and of course my Dad JJ), were so blessed to have known Wes. Even though we only had the honor of a couple of years you and he always made us feel a part of the Scotty's breakfast gang. Our hearts are broken with the loss of the remarkable man and so blessed at the same time. With his gentle smile and smiling eyes shows a man that had lived a great life. Liz, you showed him how to be loved and cared for and there are now words that can express how special you were to him. We will carry Wes in our hearts forever. Captain Wes Stone was one of the top notch pilots to fly with that came out of WW11 , what a pleasure it was to fly with him. Being hire in 1962 I got to fly with Wes on the DC-6B and the L-188 Electra, also the Boeing 720B. Wes was always good natured and treated us new guys with respect always there to help. To the family of Captain Wes Stone as you probably know is the fact he was very well liked at Western Airlines. I will love you forever. You are and always will be my father, my friend and my hero.